Other than the New Year, there is probably no other time during the year that motivates us to make a fresh start like springtime does. When the warm breezes start blowing, we want to throw open the windows and let the rebirth all around us revitalize our homes and our spirits. Because it seems natural to clean out the old during this time of year, it’s a great time to come face to face with our excuses for not getting fit and healthy. 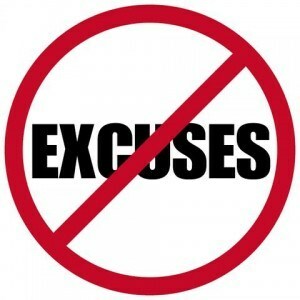 Excuses pile up just like the clutter that we accumulate in our houses, but it’s time to come clean. I’m going to be blunt with you today. This is likely one of the most common excuses. You are busy. You have to work all day (or all night), you have to get the kids to school, you have to cook dinner, go to the grocery store, mow the lawn, change the oil in the car, care for your aging parents—there is simply no time for exercise. I get it! But you DO have the time. You may have to MAKE the time, but you do have it. You’ve got the same 24 hours in your day that everyone else does, and plenty of other busy people make the time to workout. Instead of an hour class, how about a 30-minute class? If you don’t have time in the evenings to work out, how about getting up earlier and switching to a morning workout? Sit down with me and I’d be happy to help you figure out how to juggle your day to fit in regular exercise! Again, a pretty common excuse, but it won’t let you off the hook. Lots of people do not like to exercise, but they make themselves do it anyway. Do you like feeling tired? Do you like being overweight? Do you like having to undergo medical tests? Without exercise, you will feel tired, be overweight and become sick, so it comes down to choosing your ‘dislike’. I also think that nearly everyone can find a movement that they enjoy; the trick is to explore a bunch of different classes, activities, gyms and instructors, give them a solid chance (more than just once), and you too can find exercise you enjoy. If you are unfit, you likely have low energy. And when you don’t have much energy, the last thing you can imagine is exercising. But until you become more active, you will not have the energy you long for. As you begin exercising, you will start having more energy. You won’t start feeling better until you start moving. It’s just not the right time for me to start working out. It will never be the perfect time to start a fitness routine. You just have to start. You can be that way, too. Stay a few minutes after your next class with me and let’s start a plan together!